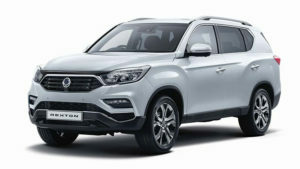 Hire Purchase is the popular choice for SsangYong drivers who want to own their vehicle. This simple payment plan is set out to take the stress out of buying your vehicle outright and is easy to apply for, able to be provided within a very short time and a decision can often be given in minutes. You even have the option of leaving no deposit. To reduce the payments, many of our customers choose a minimum £500 deposit or opt to have their current vehicle part exchanged as full or part payment of their SsangYong. If you want to know how much your current vehicle is worth towards the purchase of a new SsangYong, then use our value your vehicle form and we’ll arrange a preliminary quotation. Annual Percent Rate (APR) is low and in some cases, you can end up paying nothing in interest. You are not able to sell your vehicle privately during the contract. SsangYong hire purchase brings an affordable solution to owning a new car or commercial. SsangYongs are some of the most reliable, affordable vehicles on the UK roads and this is fully supported with their included 5-year limitless warranty. For more details on this class-leading warranty, see our dedicated page here.